The recent global financial crisis stressed the need for economists who understand how key economic and market statistics drive financial market trends and how to mitigate the risks for businesses that those trends affect. 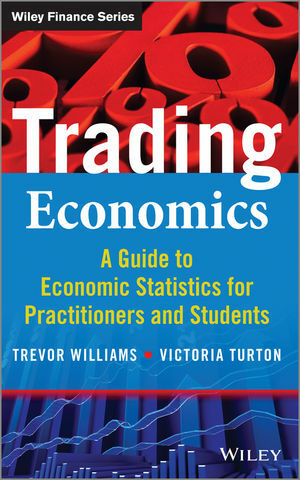 Trading Economics provides guidance for navigating key market figures in a convenient and practical format. Emphasizing the link between economic data and market movements, this book analyzes surveys, economic growth statistics, inflation, labor markets, international trade, monetary and fiscal indicators, and their relevance in financial markets. It bypasses complex terminology to offer a hands-on, accessible introduction to financial statistics and how to profit from them. Complete with worked examples and updated information, Trading Economics is an essential, comprehensive guide to understanding every aspect of financial market trends and how to navigate them to your advantage. Trevor Williams joined Lloyds Banking Group from the UK Civil Service after doing some lecturing. Trevor is currently the Chief Economist at Lloyds Bank, Commercial Banking. He regularly writes articles for publications and appears in the financial press and on television to represent economic views. Trevor is a member of the Institute for Economic Affairs Shadow Monetary Policy Committee, made up of City economists and academics. This is the oldest ‘shadow’ MPC, set up two months after the official MPC began in 1997. He is a visiting Professor, Banking and Finance, Derby University. Victoria Turton graduated from the universities of Sheffield and Manchester with degrees in History before joining the Bank of Scotland Corporate. She is currently a Senior Copywriter at Editions Financial as well as a freelance writer and editor. She lives in North Yorkshire and is married with two sons.